PURPOSE is The REASON for which YOU WERE created or for which YOU exists. The following was written on 2009 and published on other blogs. It was part of a series addressing culture, creativity collaboration and commerce and the adaptation, adopting and integration of new media and web 2.0! Observations are solely my own personal views and assessment and I welcome any opportunities to convince me otherwise! Do you know where your purpose is? 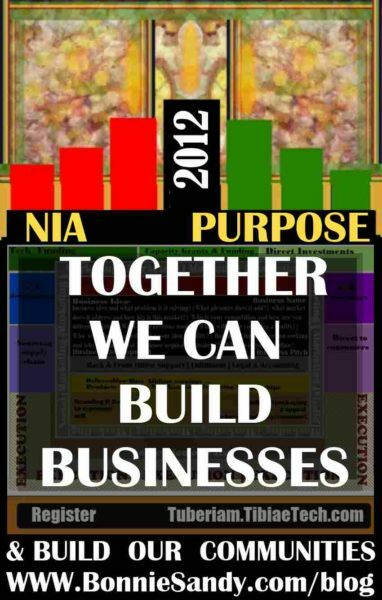 Nia (Purpose): To make our collective vocation the building and developing of our community in order to restore our people to their traditional greatness. There is a design line whose tag line .is .”It’s time to get back to greatness”. The designers has over 10 years in the fashion Industry! I recently met his wife whose purpose and desire is to be a photographer in conflict zones! I have not been able to get this woman out my mind! How does one come to decide that that’s your purpose! Her passion is photography. Her parents are from areas of conflict, as a mother, she identifies with the challenges of conflict and their effect on children, her compassion has directed her. What’s your purpose! I think too much. Sometimes you really do not need any other “company” you mind keeps you occupied! I am also critical, and stubborn. I never quite fit in… I worked in a lot of place… for about a year and then moved on! I get bored easily.. I am good with my hands and creative. I am satisfied with who I am, I am not really competitive! I have a temper and a tongue that according to one individual can “cut like a two edge sword” The point Is who I am my qualities suits my purpose… once I came around to embracing it! I am not speaking on the purpose you ( or society pressure) decided you should pursue. I am speaking about calling life purpose, mission! We all have one! We now it… deep in the moment when we can be true to ourselves we can define it! Instead we focus on “something to fall back on.” I need the insurance ( and yes we do but taking that job that ties your stomach in knots every day will send you to the hospital faster than you can spell relief! I think therefore I can solve problems other may not even see…I am happy working in solitary confinement; so long hours do not bother me! I am paid to critique products and services before money is wasted on them! My moving from job to job gave me unique skill-sets I never thought I’d need…Ever!, I’m an excellent researcher thanks to a job in field research and understand organizing information thanks to my days at the court of Appeal Library! I am a great teacher, 14 year old can school you in patience and prepare you to deal with adults! I have seen and touched more female bodies than I care to admit! I understand their needs and their anguish! My point is that even when we seem not to be on our path to purpose we are exactly where we need to be! When speaking of purpose it is all about a force grater than self! There comes a time when we have to either surrender to it or we fall and fall hard and fail! It is the same for collective purpose as outlined above! We as a community are either going to have to surrender to it or fail! Do you know where your purpose is?